Fran and John Richardson of Bowersville are national finalists for the SilverSneakers Swanson Award, which recognizes a SilverSneakers fitness program member who who has improved their lifestyle through a healthy lifestyle of physical activity while inspiring others along the way. BOWERSVILLE — John and Fran Richardson were selected as finalists for the 2018 SilverSneakers Swanson Award, it was announced earlier this month. The husband and wife were recognized for their knack for living a healthy lifestyle while inspiring others. And oh yeah, John happens to be 92 years old; and Fran just turned 89. 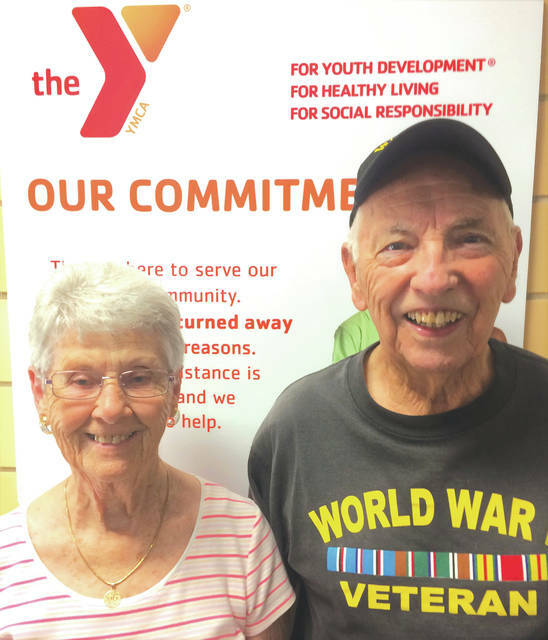 The couple make the almost 40-mile round trip from Bowersville to the Xenia YMCA on Mondays, Wednesdays and Fridays. Fran teaches an aquatics class while John lifts weights and always joins in. While Fran has been involved in the aquatics courses for the past nine years with the SilverSneakers, billed as the nation’s leading community fitness program for older Americans, she has been teaching aquatics programs at the Xenia Y for “at least 35 years now,” she said. Fran said she knew that water exercises were supposed to be good for a person’s joints, and so she joined her first YMCA aquatics class. “It was more of a deep breathing and stretching course, but a few of us wanted to incorporate more aerobics into our workouts, so we left that class and formed a more aerobics-based class in the shallow end of the pool. That’s where I’ve been the rest of the time,” she said with a laugh. The national voting for the Swanson Award ends on June 30. John and Fran finishing fifth overall. As of 9 p.m. Friday night, the Richardsons had garnered 2,408 votes. Sally Miller, a 72-year-old SilverSneakers program member from DeWitt, Mich. was running away with the contest with just over 31,000 votes. Entrants were from Florida, Tennessee, New York, Colorado, Michigan, South Carolina, Ohio and Missouri. The contest is still taking votes at SilverSneakers.com/swansonaward through Saturday. https://www.fairborndailyherald.com/wp-content/uploads/sites/50/2018/06/web1_FranandJohnRichardson_PS.jpgFran and John Richardson of Bowersville are national finalists for the SilverSneakers Swanson Award, which recognizes a SilverSneakers fitness program member who who has improved their lifestyle through a healthy lifestyle of physical activity while inspiring others along the way. We’ll have a feature on the Richardsons in next week’s Xenia Daily Gazette and Fairborn Daily Herald newspapers. Contact John Bombatch at 937-372-4444, Ext. 2123. To learn about the programs available at the Xenia YMCA, please call 937-376-9622 for details.